Beyond frog vision – Physics says what? So, here’s the thing. If I roll with Quantum Field Theory (QFT), how do I reconcile my macroscopic and microscopic views of things. Simple things. Like looking at a tiny candle across the room? At least, we could look closer. We might see light as a “blizzard” of microscopic bits of energy shooting at us, and study how biology smooths that in everyday experience, eh. “W vision” — looking closely enough? I’m exploring 2D/3D visualizations of the Schrödinger equation for a “photon” moving through space-time.1 The Wiki article for the Schrödinger equation has this animated GIF. A wave function that satisfies the nonrelativistic Schrödinger equation with V = 0. In other words, this corresponds to a particle traveling freely through empty space. The real part of the wave function is plotted here. What kind of vision might get us to perceiving light as waves? Physics lab. The double slit. We see that light exhibits interference. But how does a quantum field fluctuation move as a linear propagation from a source — a light ray in “P vision?” Does interference play any role? Is there “dampening” of vibrations outside the “main lobe” of the field fluctuation? Time to put on the “Q vision” goggles. However, other people might say that this is just the way Carroll’s concept of emergence works, namely, compatible (but different) “ways of talking that describe the same underlying world” for the same (or similar) domain of applicability. Will some future experiment decide the issue? “… many microscopic theories can lead to the same emergent behavior.” — Carroll, Sean (2016-05-10). The Big Picture: On the Origins of Life, Meaning, and the Universe Itself (p. 106). Penguin Publishing Group. Kindle Edition. My takeaway is that we really don’t understand the degree to which biological processes are grounded in quantum mechanics. The long journey of evolution, from primitive cells to complex organisms which sense and interact with the environment. We have grown out of the world. Biological processes at the molecular level grew out of the world. Things which we hardly understand as yet. Quantum biology is a young field. Update (December 2017): This humorous YouTube video “What the HECK is a Photon? !” by The Science Asylum (published on Dec 19, 2017) explores photon properties and beyond frog vision. A photon is a purely quantum mechanical object representing the smallest piece of energy (or quanta) for light. Every quantum particle is a packet of energy though, so how do we tell photons apart from electrons, quarks, and neutrinos? Visualizations perhaps like those on this Mathematica Stack Exchange page: “Complex valued 2+1D PDE Schrödinger equation, numerical method for `NDSolve`?” for the free particle propagation of an initial wave packet. Below I show the original problem of a Gaussian wave packet with no initial momentum, and then a modified case where an initial momentum has been imparted, making the initial condition complex as well. I call the complex wave function ψ and plot its absolute value … The above numerical solutions are basically for a free particle, except that the spatial grid is forcing us to choose some boundary conditions on the sides of the square. Periodic boundary conditions are a common choice. But the whole effort is overkill for a free particle because the solutions can be obtained analytically. 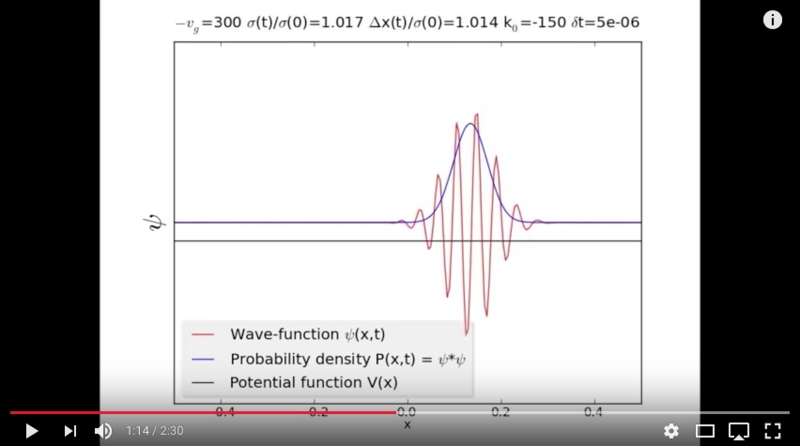 Or this “Animating Schrödinger’s Equation” YouTube video (you may want to mute the audio) for traveling wave packets (“…. a normal Gaussian distribution with standard deviation in particle position”). There’s a list of software used at the end of the presentation. 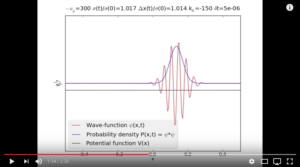 I like the overlay of the wave-function, probability density, and potential function. 2m30s fly-through of the powerpoint slides and videos used in my final year undergraduate physics project presentation; Animating Schrödinger’s Equation, one dimensional quantum wave mechanics in action, set to some dramatic music … Analogous to a method of modeling time-development of classical waves on a one dimensional string using Fourier components. … An eigenvalue problem. … Time-dependent problem: the harmonic oscillator … the first 32 eigenstates were used to reconstruct an initial electron wave packet. 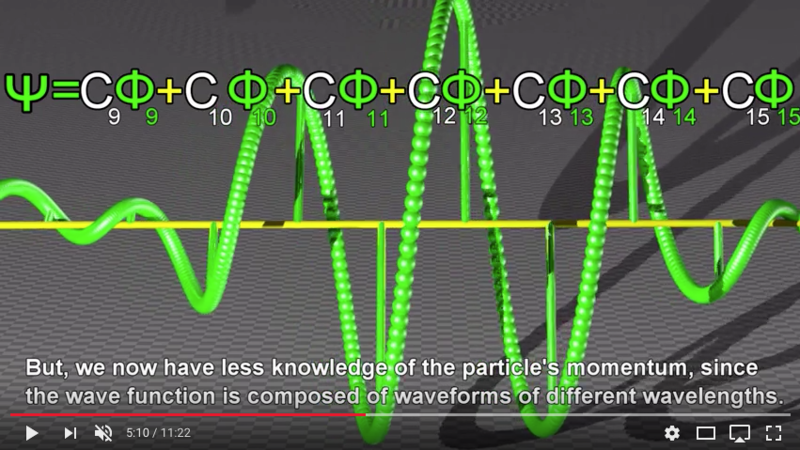 Or this professional “Quantum Wave Function Visualization” video, also on YouTube. Superposition, wave function collapse, and uncertainty principle in Quantum Physics. 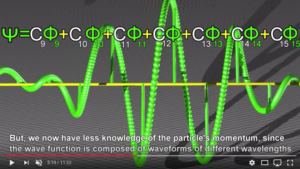 Shows real & imaginary components of quantum wave functions for free particles and confined particles. Well, this phys.org article “Spotting nature’s own evolution of quantum tricks could transform quantum technology” (November 22, 2018, University of Warwick), highlights some research in quantum biology.